Battle Royales are everywhere and have evolved from shooters with bags of guns and items, to block falling puzzle games. If Epic can continue to shake up Fortnite in retaliation to Apex Legends, and Arika can surprise us all with Tetris 99, it’s clear that the genre isn’t going anywhere – if anything, it's just getting started. It may feel like every developer in the industry is trying its hardest to venture into the ever-shrinking battlefield that is this genre, each aiming to be number one right now, but from where we're sitting we don't think the Battle Royale has gone far enough. That's right, we want more Battle Royales, and we want each and every one of them to be a little stranger than the last. If any games could have the potential to expand into the fray and still hold their own, well, we're pretty sure it's going to be these ten titles. Disagree with any of these suggestions or think you have some better ideas to contribute? Well then, you know where you can stick 'em! On Twitter please, we always value your feedback here at GamesRadar. When Edmund Mcmillen was hinting at the next (and final) DLC for The Binding of Isaac, fans immediately got amped up over the idea that Isaac was going down a Battle Royale route. After all, Edmund and the team surrounding him aren’t known for being conventional. And it isn’t a bad idea at all considering the formula of the game – its randomness, plethora of items and synergies between them – could offer players a myriad of ways to eliminate each other. We can imagine 100 players dropping into the basement maps, maybe given a five-minute head-start to create as strong a build as possible, finding item rooms and trinkets inside chests; stumbling upon other players eventually, firing tears or streams of plasma at each other to pick up a trophy akin to the challenges already built into the game. In fact, many roguelikes could fit this new mould given the procedural generation of their levels anyway. Maps can always be changing shape and size, even style. If developer Nicalis gave the players a fully uncovered map from the start, the growing storm could take the form of rooms on the map that crumble into nothingness on timers, forcing players to head inward, into the more maze-like structure of the map’s centre point. Come on now, you know that sounds great fun. When Nintendo does something, well, it often does it right. That's why many are waiting with baited breath for the company to wade into the Battle Royale space with one of its biggest series. 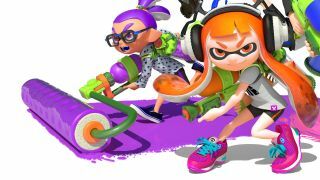 What better game to test the waters, as it were, than with Splatoon 2: Battle Royale? Come on, think about it for a second. What if you couldn't travel through the paint as an Inkling? What if 50 players were all laying down an encroaching circle of harmful paint, and you had to battle it out against 49 people within the map with Splatoon's classic array of ridiculous weaponry, all the while having to desperately dodge and protect yourself from the splashes of colour gradually covering the spaces? The reason Splatoon would work so well as a Battle Royale is because it would provide a truly unique twist to the genre: every time paint is thrown in the game – which is all of the time – the closing circle is in effect being organically created by each and every player on the map. This would mean juggling the options of taking down opposing players while winding your way to safety, counter-acting and forcing any new ‘storm’ back constantly as they appear as you look for victory. It sounds a little disruptive, but then that's the Nintendo way. It seems so obvious, it’s funny that Blizzard hasn’t already announced a BR within their character-driven shooter. With such a large world, full of lore and already established characters, it isn’t out of the realms of possibility. Of course, not all the thirty heroes could make the cut (not at launch, at least) and a lot of balancing would be needed, but a large map broken down into sections loosely based on existing maps with all that Blizzard charm could work. Plus, the user base is already there and itching for something new in the Overwatch universe. Should Blizzard head down this track, it would be direct competition to Apex Legends who already use strong characters within the genre, and with tremendous success. If we were to look at direct comparisons, many of the roster is already prepared for the jump; Reinhardt with his shield, Mercy for healing, Lucio can outflank opponents, and Sombra could confuse others. To be honest, we wouldn't be surprised to see Blizzard to launch something of this type into closed early-access to see if it could work – all eyes on Blizzcon 2019! The wrestling world loves a Battle Royale, no matter what corporation runs a wrasslin’ event it’s a good bet that they will put several outlandish characters in a ring and we’ll watch them fight until only one is left standing. So, for the next outing of the WWE franchise, let’s get 100 people in an oversized ‘square-circle’ and watch as carnage ensues. No Royal Rumble structure of entering every couple of minutes, just dump everyone in and see who wins. It’s striking that this hasn’t happened already, considering the WWE roster alone is bursting with wrestlers past and present for players to use. Of course, we need to look at this from a logistical perspective; getting 100 players all using different wrestlers, programming the collisions and connections would be a nightmare. Besides, we all know that it would end up being 100 Undertakers all trying for Choke Slams at the same time. If that doesn't sound appealing then… well, we don't know what to tell you. What? If Tetris can work as a Battle Royale, so can Guitar Hero. Although we’re stretching the idea of the genre a little here. There would still be 100 players, but this time the circle of doom is the tempo of the track you’re playing. Slowly speeding up until the inputs are a near blur of button mashing madness. You’re probably thinking, “but what about those people who can ace Dragonforce on expert?” and you have a point. But there are experts at T-Spins in Tetris getting crushed by others in different ways. Remember the tilting of the guitar would boost your high score? What if it spun a wheel of debuffs that are randomly applied to the top ten players? A button layout switch or individual speedup could be the equivalent of finding that golden rifle in a Tilted Towers chest. And, of course, players who have exited early have the chance to watch some genuinely impressive guitar gameplay from remaining players. We shouldn't need to tell you that TimeSplitters is well overdue a revival. And what better way to do it than in a genre that everybody is already playing? A TimeSplitters Battle Royale only needs to take the tight controls, wacky character designs, and speedy gunplay from the original games and bring it to a modern audience. This would need to be a straight facsimile of the gameplay found in Fortnite or PUBG, with a twist on the way in which items and weapons are found. That said, if the game really wanted to leave its own mark on the genre, it could even be built around community creations – the TimeSplitters map editor is legendary after all – with the developer working to highlight the best new maps as they appear, giving players an endless array of new worlds to explore as they battle it out to the end. Using the same off-the-wall humour found previously, there’s nothing stopping a TimeSplitters entry stealing the hearts and minds of players across the world. Super Mario Maker provided hours of content for players and streamers through the 100-Mario challenges, requiring the mustachioed plumber to make it through tough courses before using up 100 lives. If there were a lobby where 100 players enter, each with 100 lives, and they all vote on a batch of courses to run; we have the makings of a truly bizarre and wondrous Battle Royale here. Whoever gets to the flagpole at the end of the designated batch of super tricky courses first is the winner, and the games interact with each other through power-ups and power-downs collected throughout the levels. Not only would this open up even more tough-as-nails Mario gameplay for us to get involved in, but it would merge two areas of gaming into one entertaining outlet – speedrunning and Battle Royale would combine for ludicrous moments of fun and frustration in equal measure. To be honest, if Nintendo doesn't make this happen there's a good chance that the Twitch, Mixer and YouTube streamers of the world could engineer this for us, if we all ask nicely, that is. There are already so many racing games out there with elimination races included in the game modes. Where a set number of cars are placed on the track and with each lap, the last position player is eliminated. Really, any racing game would fit the bill here, but keeping the theme of weapons and items, it seems that Karting games would do the job best. While we didn’t want this list to be full of Nintendo licenses, it would seem that so many of their games would fit the Battle Royale template well. Imagine racing with 49 other people (100 laps would be a bit much) and securing that blue shell, knowing that tactics play a huge part. Do you use it early and remove a player or do you sit on it? Or leave the field to assault you while you hold out until nearer the end to guarantee yourself an extra position? Side note, for whatever it is worth: We would also accept a Battle Royale based on the SEGA classic, Out Run. In fact, we wouldn't just accept it, we demand it. Come on Sega. If the Championship Editions of Pac-Man have taught us anything, it’s that the Namco mascot can be used in a myriad of ways. We can’t quite decide on how this Battle Royale would work as there are several options. The first being in the style of Tetris 99, where players each have their own maze and must reach the win condition against the odds – the speed of movement, pathways being blocked off or more ghosts. However, there could be the option of one massive maze featuring a set number of players all striving for the highest score, while watching out for the usual pitfalls of the franchise. On top of this, opponents being able to gulp a Power Pill and gobble you up to slow you down or remove points could add an extra layer of tactics. Okay, look, so this entry is a little more aspirational than the others. But, and let's be real clear here: it's our job to dream the games and it is your job to make the games, Namco. We believe in you. Let’s just do a massive brawling Battle Royale featuring all the blocky goodness of the Traveller's Tales LEGO games. Coins could be exchanged for weapons in the field, or skins back in the menu. All of which could be pulled from the many universes the developers have already touched. Bright, colourful vistas bursting with geometrically shaped trees, lavish constructions of generated plastic. We aren't saying this would be easy for TT – the licensing agreements that would need to be put in place to make this work are dizzying. But that doesn't concern us all that much, because we want to see Harry Potter taking out Gandalf with a Batarang in an ever-decreasing square – because there are no circles in LEGO, obviously – of danger. Perhaps that danger could come via random human hands of destruction or a mother’s broom sweeping away the fun. We wouldn’t mind the odd naked foot crashing down on our player, too. If Fortnite is already pulling in children across the globe, imagine what adding LEGO to the equation could do. So, there we have it. Ten franchises that could stretch their legs within the latest genre to grab the attention of players everywhere. Some are of course incredibly tongue in cheek, whereas others seem genuinely possible given what we already have on the scene. The emergence of a new genre within games always brings excitement and opportunity, but if any companies use these ideas, we’ll happily accept our cut of the profits, a producer credit, and all of the praise on Reddit. No, you're welcome. Looking for some great Battle Royale games to play right now? Why not give these 15 awesome Battle Royale games like PUBG a try.